Looking for a fun way for your kids to play indoors or out? 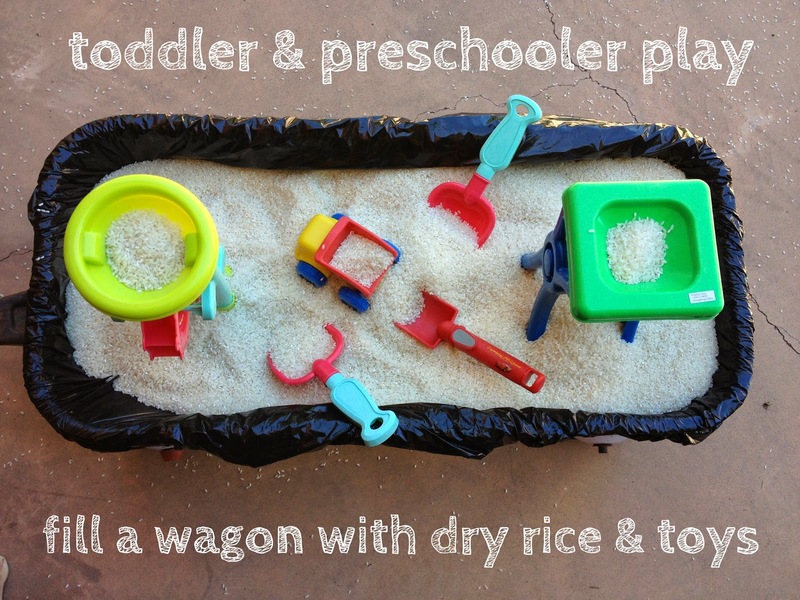 Fill a wagon with dry rice and toys for "sensory" play. Sensory play can be an important to a child's development. They get a chance to experience their world "hands on" by touching and feeling the world around them. It's also good for imaginary play. You can fill bins with contents such as dry beans, cotton balls and rice to create an environment where preschoolers and toddlers (and even older kids too) can explore. Rice is a common, non-toxic sensory bin filler that provides endless hours of play fun for toddlers and preschoolers. Sensory bins can be any size, from a small plastic shoe box size to the large trough size. When I saw that my mom had filled an old wagon with dry rice for sensory play for my niece and nephew, I knew I had to share it with you! Even my elementary aged kids loved it. It's a portable sensory bin!